The aviation analytics market is estimated to be valued at USD 2.16 Billion in 2016 and is projected to reach USD 4.23 Billion by 2021, at a CAGR of 14.38% from 2016 to 2021. The objectives of the study is to analyze the market along with the statistics from 2016 to 2021; to define, describe and forecast the market on the basis of application, business function, end user, and region. The year 2015 is considered to be the base year for market study. 2016 to 2021 is considered as the forecast period for market study. 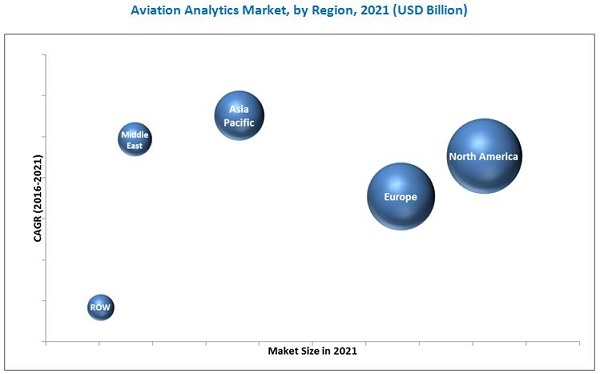 The ecosystem of the aviation analytics market comprises various business functions, applications, end-use industries. Various aviation analytics solution providers such as IBM Corporation (U.S.), Oracle Corporation (U.S.), General Electric (U.S.), SAP SE (Germany) and SAS Institute (U.S.) offer different analytical solutions for the retrofit and line fit applications to different airline companies. The aviation analytics market study answers several questions for stakeholders, primarily of segments to focus over the next five years for prioritizing efforts and investments in order to maximize their profitability. The aviation analytics market is projected to grow from USD 2.16 Billion in 2016 to USD 4.23 Billion by 2021, at a CAGR of 14.38% from 2016 to 2021. The market exhibits a lucrative growth potential in the coming years, primarily driven by real-time analytics and competitive intelligence. High adoption of analytics in the aviation industry help organizations reduce costs, increase profitability & revenue, and improve performance & maintenance. The market has been segmented based on application, business function, end user, and region. 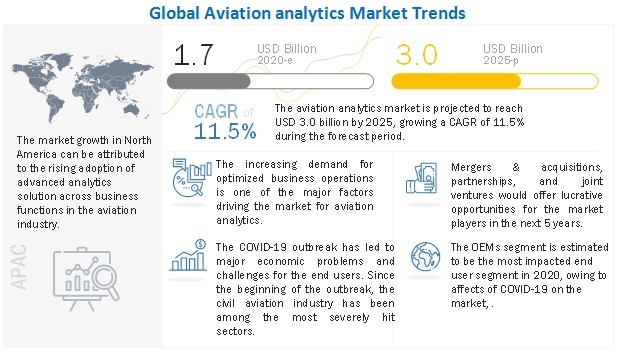 On the basis of application, the aviation analytics market has been subsegmented by customer analytics, revenue management, flight risk management, fuel management, navigation services, and inventory management among others. The customer analytics subsegment in market is projected to grow at a fastest CAGR during the forecast period. The aviation analytics market, by business function has been subsegmented based on finance, operations, maintenance & repair, sales & marketing and supply chain among others. The finance sub-segment dominates the studied market in terms of market size, and is expected to continue its dominance over the next five years. However, the sales & marketing segment in market is projected to grow at the highest CAGR during the forecast period. The end user segment in the aviation analytics market has been subsegmented into airlines, airports among others. The airline sub-segment in market is projected to have the highest market during the forecast period. With the help of big data mining and architecture, the airline companies can have an in-depth competitive analysis. This helps the company to develop business models like engineering & maintenance optimization, safety & security risk modelling, demand modelling & forecasting among others. The APAC region is expected to exhibit the highest growth rate in the aviation analytics market, during the forecast period from 2016 to 2021. The region has been witnessing strong growth in aviation industry over the past few years, mainly driven by improvement in operational efficiency, increasing consumer expectations, and the growing pressure of reducing costs across regions. This growth can also be attributed to the increasing middle class population coupled with growth in trade and tourism in emerging countries such as India and China. The aviation industry analyses and generates insights from various data formats, such as text, video, speech, and images for their businesses. A variety of data models exist for different types of business needs. These data models are integrated with specific types of analytical solutions. The management often lack knowledge on how to analyze the varied dataset generated in order to make their strategic decisions because of the complexity involved in the entire process. Key players profiled in the aviation analytics market report include IBM Corporation (U.S.), Oracle Corporation (U.S.), SAP SE (Germany), General Electric (U.S.), SAS Institute (U.S.), Ramco International (India), Mu-Sigma (U.S.), Mercator (U.S.), Aviation Analytics (U.K.), Airport Analytics (U.K.) among others. IBM is an eminent player in the analytics market and enjoys unquestionable leading status in the analytics solutions market. It holds many analytics patents and offers various analytics solution that includes aviation analytics to meet the diverse needs of its clients. Also, Oracle Corporation has increased the adoption of cloud-based software which involves integrating its own products such as Oracle Fusion in aviation analytics market. The company intends to offer most of its product offerings through cloud-based platform in market.